We are in the season of Love, and we are expected to extend it to one another. On doing this, Spectranet has just unveiled a new Mifi called EVO. EVO is a limited 4G LTE MIFI that comes with mouthwatering data plans. The mifi is designed and targeted at young people and comes with just two data plans. One of the plans offering 40GB for N20,000 while the second plan offers unlimited data for N25,000. That's not all, there's more. Customers will enjoy 50% data bonus in their next 6 renewals within 210 days of activation. With limited edition, Spectranet encourages all Nigerians especially women, to walk into any of the Spectranet exclusive shops or Dealers and purchase one for their loved ones. The offer is valid while stock last. The launch of EVO MiFi is aimed at fostering love and bonding among the young-at-heart this Valentine season. With this innovative offer, we would like to encourage the Nigerians to express their love freely with affordable, high quality, high-speed 4G data connectivity. EVO MiFi is specifically designed as a perfect gift for women. As a mark of tribute to the entrepreneurship of Nigerian women. Spectranet plans to launch two “women only“ stores in Lagos before Valentine’s day. By extending the high-speed broadband connectivity to the Nigerian women, EVO MiFi will help achieve the 30% broadband penetration target set by the Nigerian Communications Commission. The target can be only attained when more people, especially women, are connected to broadband and internet services. 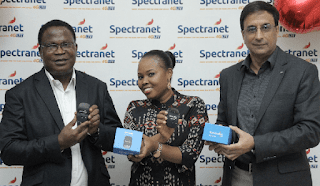 Spectranet Limited is the first 4G LTE provider in Nigeria. The brand is also known for its high-speed internet connection and affordable data plans for personal and business owners. The 4G LTE provider is currently available across Lagos, Abuja, Ibadan and Port Harcourt. EVO MiFi is the latest device in the Spectranet mifi family. It is a limited edition, very portable and you can purchase the EVO MiFi at any of Spectranet shops, sales outlets in Lagos, Abuja, Port Harcourt, and Ibadan. Nice offer there, the 25k for unlimited makes sense, but only if the service is working well and stable. It's quite unfortunate you didn't read the post.